New technologies in mammography, such as 3-dimensional (3D) tomosynthesis and contrast-enhanced spectral mammography (CESM), have a role in increasing the sensitivity and specificity of breast cancer detection. Recently implemented in many breast imaging practices, 3D tomosynthesis has been shown to increase the number of BIRADS 1 and 2 diagnoses and decrease BIRADS 3 category exams, providing a more definitive diagnosis and limiting the cost, time and anxiety of short interval follow-ups associated with BIRADS 3 exams. The number of BIRADS 4 and 5 categories has not significantly changed as reported by Raghu et al.1 Tomosynthesis detects architectural distortion well and clears up focal asymmetries quickly, since most are due to overlapping breast tissue and require no further follow-up. This, in turn, reduces callbacks from screening mammography. Both tomosynthesis and CESM add value to the diagnostic workup of breast lesions in their own way. We review and highlight the role of each modality, including their advantages and disadvantages, followed by an illustrative clinical case in which each modality was used and contributed to the ultimate diagnosis. In clinical use since the 1970s, 2D screening mammography has provided multiple improvements in technique, image quality, and patient positioning since its implementation. The widespread screening of asymptomatic women has slowly become the standard of care, increasing detection of noninvasive and invasive breast cancers. With changes in technology, digital imaging began to replace screen-film mammography by the early 2000s, reducing length of exposure and radiation dose from the examination. 3 Digital mammography also improved assessment of heterogeneously dense and extremely dense breast tissue, providing an additional advantage over screen-film mammography. However, overlap of glandular tissue remains an issue with 2D imaging, resulting in increased recall rates and additional workup with diagnostic mammography, often in combination with ultrasound assessment. The false positive and false negative findings continue to be problematic in everyday practice. Digital tomosynthesis is a 3D technology that obtains multiple thin sections through each breast. This results in improved assessment of breast parenchyma due to decreased overlap of glandular tissue and a resultant decrease in false positive and false negative findings that are inherent in 2D technology. This technology also enhances characterization of mass margins and triangulation of abnormal findings in the breast, increasing cancer detection rates while lowering recall rates and patient anxiety associated with additional imaging workup.4 Small masses, such as cysts or intramammary lymph nodes, previously concealed by overlapping glandular tissue, are now easily detected on tomosynthesis and may be further localized and evaluated with targeted ultrasound for definitive characterization. However, these benefits come at the expense of increased radiation exposure. Three-D tomosynthesis is currently approved in combination with 2D digital mammography, further increasing radiation dose from a single study. Although detection and localization of skin microcalcifications is improved with 3D technology, overall assessment of parenchymal microcalcifications is limited. Detection of microcalcifications is crucial in diagnosing both invasive and in situ cancers. CESM combines the advantages of digital technology with contrast administration, highlighting neovascularity associated with actively growing malignancy.2,5-10 Simultaneous low- and high-energy exposures are obtained, producing low-energy and subtraction views evaluated by the radiologist immediately following image acquisition to identify areas of concern that may require further workup. This technique is utilized in daily practice for high-risk screening, diagnostic workup, staging of known breast cancer, and assessment of chemotherapy response, particularly in patients with contraindications to MRI. Although superior in identifying masses, CESM is less sensitive compared to 2D mammography for detecting microcalcifications. CESM low-energy images are not approved to replace 2D mammography; however, they typically provide adequate visualization of microcalcifications, offering an advantage over tomosynthesis. Benign masses such as fibroadenomas or lymph nodes enhance after contrast administration, and careful assessment of mass margins coupled with ultrasound evaluation is needed to avoid false positive results and unnecessary procedures. As CESM technology relies on iodinated contrast administration, review of patient history and laboratory findings is necessary to avoid the potential risk of allergic reaction or deterioration of renal function. Although the radiation exposure from this technique slightly exceeds that of 2D mammography, it is significantly lower compared to 3D tomosynthesis. A 58-year-old woman presented to the breast clinic for assessment of a palpable abnormality in the left lateral breast that was identified 2 weeks earlier by the patient’s gynecologist during a routine annual visit. At the time, she was also past due for her annual mammogram, with her most recent mammogram performed 15 months prior. A marker was placed on the lateral left breast in the location of palpable concern and the workup was initiated. The workup started with 2D digital mammography, which revealed heterogeneously dense breast parenchyma bilaterally with stable distribution since prior examination. An asymmetry with increased density in the mediolateral oblique (MLO) projection of the left breast was marked by computer-aided detection (CAD) and was in close proximity to the skin marker; however, no focal abnormality could be appreciated on the craniocaudal (CC) projection in the same region on 2D mammography (Figure 1). Due to overall increased density of the breast parenchyma, the suspicious MLO finding, and added palpable concern, further assessment followed with 3D digital tomosynthesis, which highlighted the presence of a 1.4-cm lobulated mass with associated spiculations deep in the lateral superior left breast, in the area of palpable abnormality (Figure 2). Tomosynthesis also revealed several small circumscribed masses in both breasts. In light of highly suspicious tomosynthesis findings, bilateral staging with CESM immediately followed and confirmed the presence of an avidly enhancing mass in the lateral superior left breast (Figure 3), not marked by CAD on the initial 2D CC projection. No additional areas of suspicious enhancement were identified on either side, resulting in preliminary T1c stage with respect to the size of the index mass. Ultrasound revealed a hypoechoic mass taller than wide in the left breast at the 2 o’clock position, correlating to the palpable abnormality and the mammographic findings. Ultrasound survey of the left axilla demonstrated small lymph nodes, nonpathologic by size criteria and by sonographic appearance. Several small parenchymal cysts within both breasts correlated with additional circumscribed masses noted on 3D tomosynthesis. Upon completion of the workup, the patient was staged as IA based on TNM classification and was scheduled for percutaneous biopsy for tissue diagnosis. Ultrasound-guided biopsy of the left breast mass was performed with a 9-gauge vacuum-assisted needle, confirming the presence of infiltrating ductal carcinoma, grade 3, ER, PR and HER-2/neu negative. Due to the aggressive nature of the primary malignancy and despite the normal sonographic morphology of the left axillary lymph nodes, ultrasound-guided biopsy of one of them was performed, revealing no evidence of metastatic involvement and confirming preliminary stage IA breast cancer. In the illustrative case, all three mammographic techniques were used to diagnose and stage the presumed malignancy. Each study provided a unique piece of information that contributed to the workup, ultimate diagnosis and complete staging. The 2D digital mammogram identified an abnormality on the MLO projection with limited visualization on the CC view, likely in part related to overlap of glandular tissue. Subsequent 3D technology accurately localized the mass and improved localization and assessment of the mass margins, highlighting the associated spiculations and architectural distortion. Finally, CESM completed the staging workup revealing no additional suspicious enhancing mass in either breast. Interestingly, the visualization of the primary mass was improved on the low-energy CC and MLO CESM projections when compared to the initial 2D digital mammogram, especially on the CC projection. This observation may be related to the presence of iodinated contrast in the intravenous system and breast parenchyma during CESM image acquisition. This case highlights the benefits and advantages of each modality — 2D, 3D, and CESM — particularly when used in conjunction with one another. A diagnostic or high-risk screening technique that could combine 3D and CESM technologies into one unit in a single examination would prove advantageous to many patients in terms of improved lesion detection and characterization, decreased study length, and reduced number of images acquired in a single examination, coupled with significantly decreased combined radiation exposure. Ideally, this unit would also offer percutaneous biopsy capability for tissue diagnosis, further streamlining the workup while lowering the overall radiation exposure. Raghu M, Durand MA, Andrejeva L, et al. Tomosynthesis in the diagnostic setting: changing rates of BI-RADS final assessment over time. Radiology 2016;281(1):54-61. Bhimani C, Matta D, Roth RG, et al. Contrast-enhanced spectral mammography: technique, indications, and clinical applications. Acad Radiol 2017;24(1):84-88. Joe B, Sickles E. The evolution of breast imaging: past to present. Radiology 2014;273(2):S23-S44. Roth RG, Maidment A, Weinstein S, et al. Digital breast tomosynthesis: lessons learned from early clinical implementation. Radiographics 2014;34:E89-E102. Daniaux M, Zordo T, Zantner W, et al. Dual-energy contrast-enhanced spectral mammography (CESM). Arch Gynecol Obstet 2015;292:739-747. Dromain C, Balleyguier C, Adler G, et al. 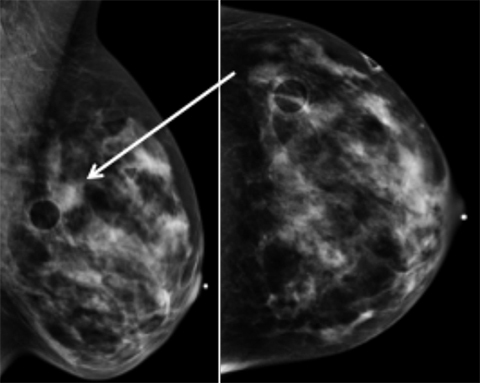 Contrast-enhanced digital mammography. Eur J Radiol 2009;69:34-42. Dromain C, Thibault F, Muller S, et al. 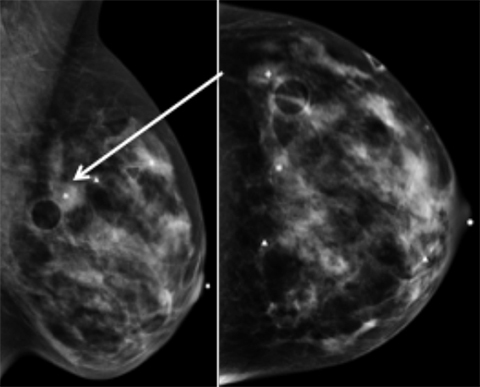 Dual-energy contrast-enhanced digital mammography: initial clinical results. Eur J Radiol 2011;21:565-574. Fallenberg E, Dromain C, Diekmann F, et al. Contrast-enhanced spectral mammography versus MRI: initial results in the detection of breast cancer and assessment of tumour size. Eur J Radiol 2014;24:256-264. Jochelson MS, Dershaw DD, Sung JS, et al. Bilateral contrast-enhanced dual-energy digital mammography: feasibility and comparison with conventional digital mammography and MR imaging in women with known breast carcinoma. Radiology 2013;266(3):743-751. Lobbes MB, Smidt ML, Houwers J, et al. 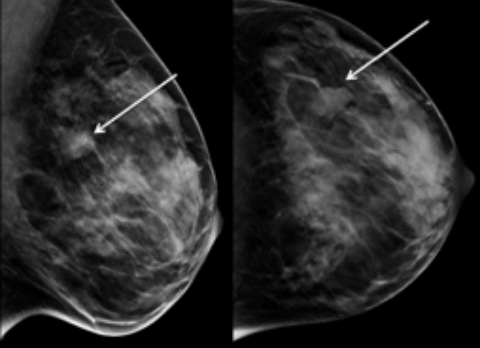 Contrast-enhanced mammography: techniques, current results, and potential indications. Clin Radiol 2013;68:935-944. Bhimani C, Matta D, Liao L, Germaine P. Role of 2D, 3D, and Contrast-enhanced Spectral Mammography in Diagnosis and Staging of Invasive Ductal Carcinoma. J Am Osteopath Coll Radiol. 2017;6(4):12-15. Chandni Bhimani, D.O., Danielle Matta, D.O., Lydia Liao, M.D., Ph.D., M.P.H., Pauline Germaine, D.O. Drs. Bhimani, Matta, Liao, and Germaine work with the Department of Radiology, Cooper University Hospital, Camden, NJ.